Tim Shaw is Australia’s best contemporary salesman. He’s a real ‘Best Seller’ with his well known tag line “But Wait There’s More” He is also an actor, talkback radio host, TV presenter, journalist and author. 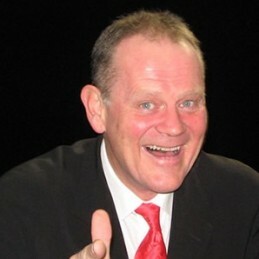 Through his many television appearances on all commercial TV channels, particularly as the presenter of the infamous Demtel commercials, Tim Shaw is a national household name. His credibility and effectiveness has enabled him to sell more than $100 million of product – branding him Australia’s most effective sales presenter, host and communicator. He was the ‘Voice of the Rocks ‘on Sydney Harbour and was a Sydney New South Wales 2000 team member at the Sydney Media Centre, Darling Island during the Sydney 2000 Olympic Games coordinating TV media in the Rocks Precinct. An accomplished radio broadcaster, Tim has hosted his own program. The Tim Shaw Show on Sydney Radio 873 2GB after four very successful years as the host of the summer series on Sydney’s Radio 2UE afternoon program. Demand for Tim’s services for television campaigns, radio and press advertisements, Ecommerce marketing strategies, corporate videos, conference keynote, education and training seminars and award presentations continue to grow. He has appeared on all commercial television networks in Australia including programs such as A Current Affair, Today Tonight and Good Morning Australia, Kerrie-Ann, 9am, and currently on Channel 7’s “My Business TV” program with David Koch as a sales marketing and small business expert. Previous television advertising campaigns and corporate video presentations have included Daihatsu, Pizza Hut, Countrylink, Toyota, ARK, AFL Centenary Celebrations the 1996 Royal Easter Show (record attendance followed), Kellogg’s Corn Flakes, The Australian Women’s Weekly, Sony Music & McDonalds Family Restaurants. Corporate clients have included NSW Department of State & Regional Development, Westfield & Centro Shopping Centres, The Sydney Harbour Foreshore Authority, Telstra, Optus, Canon, Toyota, National Film and Sound Archives, Suncorp, Priceline, Australian Hotels, AMP Association, Real Estate Institute of Australia, Rams Home Loans, Nationwide Real Estate 2DAYF, Facilities Management Queensland & Subaru Australia.